Anastasia is Cinderella's second stepsister who takes pride in her flautist skills, despite not having any. 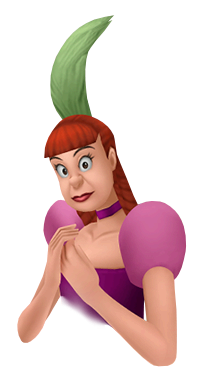 Lady Tremaine's influence has stained her heart, as she is determined to be picked as Prince Charming's bride and is willing to step on Cinderella to get there. This involves giving the maiden endless chores and ripping apart the dress Ven and Jaq made for her. Like her mother and sister, she becomes victim of her own darkness.